With Office and OneDrive, you can co-edit and share files right in your Office apps, such as Word, Excel, PowerPoint, and Visio. The OneDrive desktop app and Office work together to sync documents in OneDrive and let you work with other people on shared documents at the same time. To collaborate on documents in real time in the Office desktop apps, you need a Windows computer running the latest version of Office and an Office 365 subscription. For info about real-time co-authoring, see Collaborate on Word documents with real-time co-authoring, Collaborate on Excel workbooks at the same time with co-authoring, or Work together on PowerPoint presentations. For info about syncing OneNote notebooks, see View the notebook synchronization status. Most of the time, Office automatically syncs changes to Office files saved in OneDrive. On rare occasions, if an Office app closes unexpectedly, or if changes made from different devices can't be resolved, a sync conflict can occur. If you run into problems with changes not syncing or merging properly, you might want to change your sync settings in OneDrive. Note: If you don't see this tab, and you're using Office with a work or school account, the setting might be controlled by your IT admin. 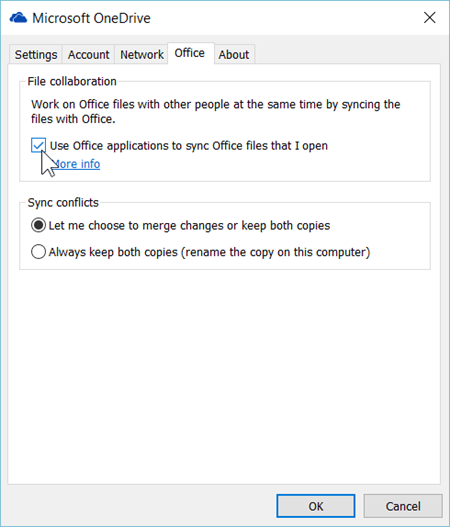 To stop using Office to sync Office files, clear the Use Office applications to sync Office files that I open check box. Note: If you turn off this setting, Office will no longer be able to automatically merge changes from different versions of documents. You'll also be prompted to upload a new copy of a file before you can share it directly from an Office desktop app. Let me choose to merge changes or keep both copies If you choose this option, when you have a Word, Excel, PowerPoint or Visio file with conflicting changes, OneDrive will ask you if you want to open the file in Office to merge the changes, or keep both copies. 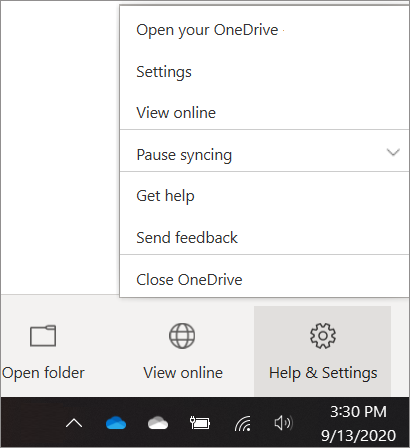 Always keep both copies (rename the copy on this computer) If you choose this option, OneDrive keeps both copies of the file and renames the copy on your computer to add the computer name to the file name.